For the second time we’ll do the I Love Milano tournament on November 29th. It’s going to be tough, but also fun and at the end the winners will be rewarded for their pains with numerous but special prices such as high-end bicycle frames from Pegoretti and Vigorelli as well as gear from us and all participating partners. Of course that’s not all and at the very same night we’re going to test your mental and physical condition as well by celebrating the Urban Velodrom Party with up tempo sounds by DJs Matt Roan and E-Six from Chicago and Peak Nick + Club Silencio. Now you’re asking “…and where are the movies?” You won’t be disappointed. Promise. 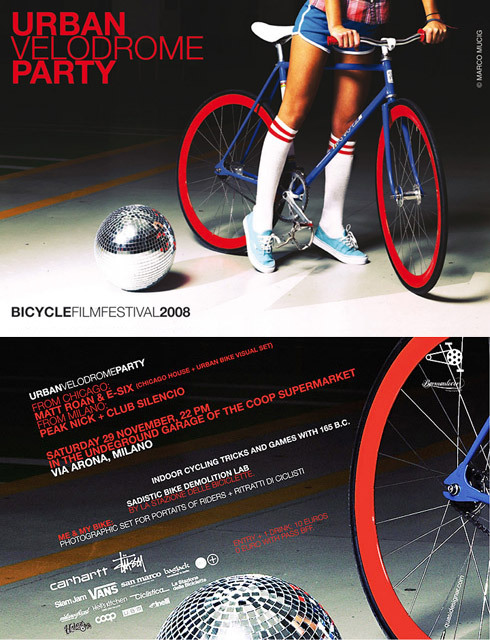 Actually the organizers of the Bicycle Film Festival 2008 got so much in their shelves that we have to ask you to see the official Bicycle Film Festival Milan website for details and to believe. You can also download the whole program here.